The cyber threat to businesses is growing year after year. In 2017 we saw large, high-profile attacks of companies including Uber, Deloitte, Equifax, and the fallout out from Target’s breach in 2013 was continuing to make headlines as they worked to wrap up their settlement, almost 5 years after the initial breach. Data security is an constant concern in the small and mid-size business sector, but there’s still a perception that only the big companies are a target… they aren’t looking for companies like ours. Unfortunately for us all, that’s not the case. 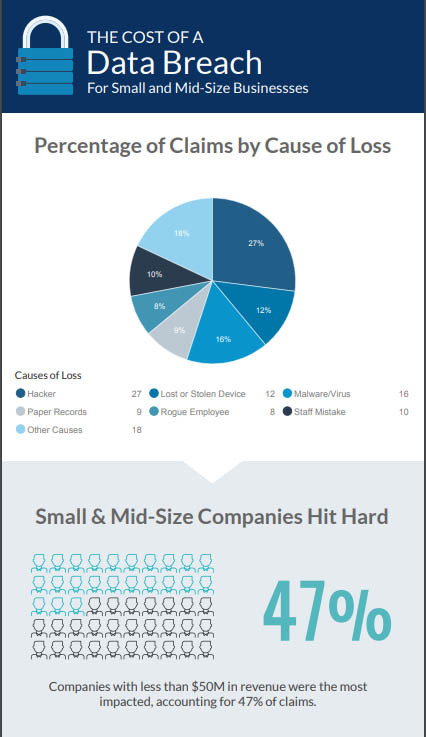 Despite the large breaches being the news makers, 47% of cyber attacks are focused on small and mid-size businesses, and 50% of small and mid-size organizations reported suffering at least one cyber attack in the last 12 months. Learn more about what happens, and how with our infographic below – see the complete infographic at the bottom of the article. Those are some depressing numbers. Fortunately there are plenty of resources to protect your business. One of your top priorities is definitely protecting your financial information, employee records, customer information and sensitive business data. Unlike many web-based applications, with Acumatica you are in complete control of where your data is stored and processed, and you control who can access and use your system. To transfer information between Acumatica and the user’s browser, Acumatica uses ‘https’, the same encryption technology used by banks to ensure no one can ‘listen in’ on your data. For especially sensitive information, Acumatica encrypts certain fields such as credit card numbers, social security numbers, names and salary information within the database. This protects you in the event a backup copy of your information is lost or stolen. You can also choose to designate any fields you wish to be encrypted. Security policies can be assigned by user or by role. Assigning security settings by role, reduces the chance for error. An unlimited number of roles can be created, so there is no limit to the types of security rights you can grant. User menus display only the applications, pages, and reports each individual user is authorized to access. Forms, reports, and inquiries will not contain data not authorized for a user. This reduces accidental access to sensitive information and makes Acumatica easier to learn and use from the start. User logins can be limited to specific IP addresses. You can define how long a user password must be, and how often they must be changed. You define when a user’s browser session times out due to inactivity. One Time Passwords (OTP) systems can also be used to issue new passwords every few minutes, and link to the users cellular phone or a keychain device. Each transmission between the browser and the application server is re-validated from an encrypted key. Acumatica maintains a timestamped log of user activities in the system. Some of the events (or activities) tracked are: login and logout, session expiry, login failure, screens accessed, send email success, send email error, and record creator. You can setup notifications for certain events down to field level changes. This information is crucial not just in identifying a data breach, but also where audit trails are a required part of doing business.